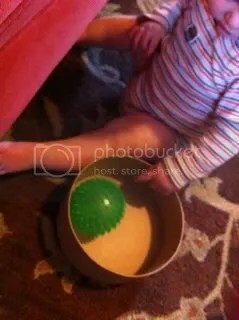 This activity is so simple, yet it captured Plum2’s interest for at least 15 minutes. 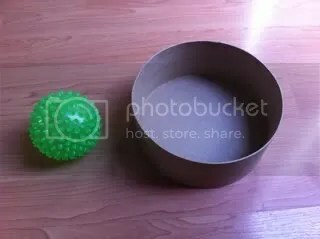 All you need is a box and a ball. Taking the ball, I put it in the box and said, “in”, then pick up the ball and said “out”. Next I handed Plum2 the ball and waited to see what he would do. He, of course, chewed on it. So as soon as he dropped the ball, I repeated my demonstration. After of few rounds of chewing and demonstrating, he decided my game was fun to play. 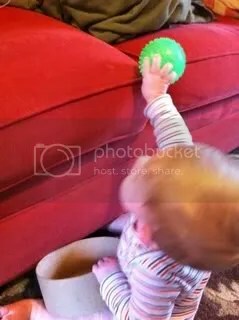 After a bit Plum2 also discovered that he could put the ball up on the couch and it would roll right off. 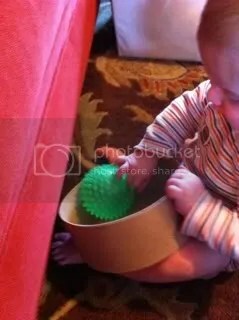 He thought that was lots of fun. I narrated up and down while he played his new game. 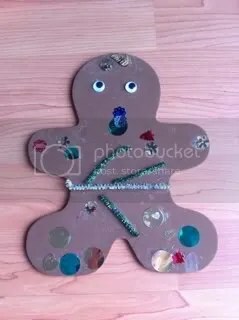 I was really excited about this craft because it combines the some Montessori fine-motor work with a fun snowman activity. All that I needed to do to get ready was to cut three pipe cleaners into three different lengths and pour some beads into a tub. 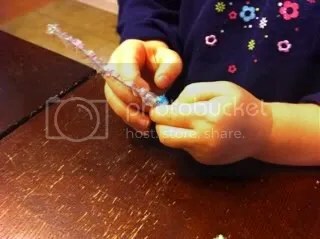 With one demonstration of how to put the bead onto the pipe cleaner, PlumGirl was started. I also had to show PlumGirl how to move the beads to the middle of the pipe cleaner to make room for the next bead. The biggest obstacle to this activity was our cat, T, who thought that the pipe cleaners were toys just for her. 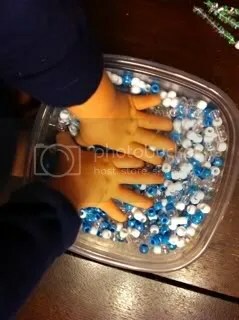 Once PlumGirl decided that the beads were more fun to pick up and pour out of her hands we had to stop beading. I let her experience the feeling for a few minutes, and then we moved on. I showed how to bend one of the pipe cleaners into a circle and PlumGirl wanted to try too. Her second attempt was much better. 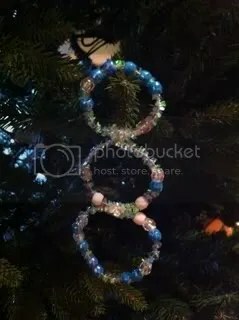 I simply twisted the ends together, and then onto the next circle, and we had a snowman! Yesterday, I had the rare treat of being able to run some errands ALONE, so I was able to stop at a few stores and gather a bunch of craft supplies. I have some big plans! When I got home PlumGirl and I did our first Christmas craft. 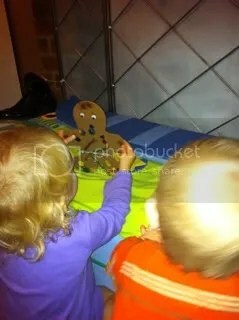 I pulled out our Gingerbread Baby book, and then showed her a foam gingerbread man I had bought. I gave her two eyes and a tub of sequins to use as decorations, as well as a few pipe cleaners I had cut up. PlumGirl could not quite squeeze the glue bottle, but she loved showing me where to put the glue and then helping me squeeze it out. 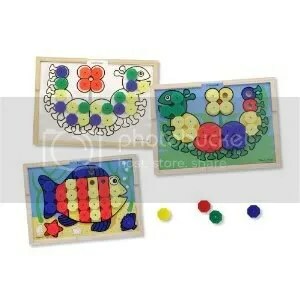 She was very precise in placing the sequins onto the dots of glue. 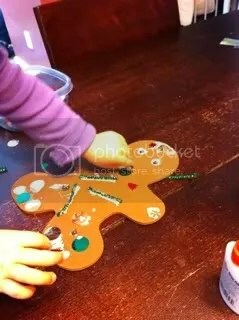 After putting on a few decorations she started referring to her gingerbread man as “Cowboy”. 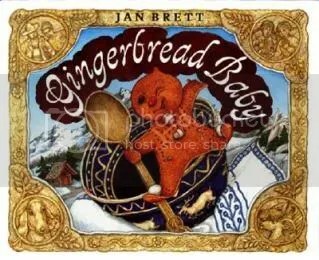 That is when I realized that we were not making a Christmas gingerbread baby, but rather the Gingerbread Cowboy. 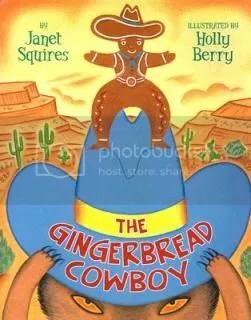 She made him a hat, boots, and belt, just like the real thing. 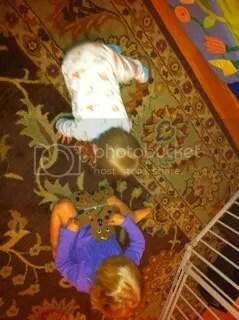 When we were done, she wanted to carry him around and play with him. I told her that he needed to take a nap while the glue dried, and fortunatelt she agreed thay was a good idea. After a short rest the cowboy was ready for action! 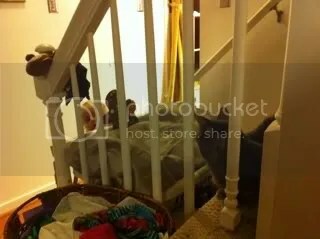 and even showed him off to an unimpressed cat and laundry basket. 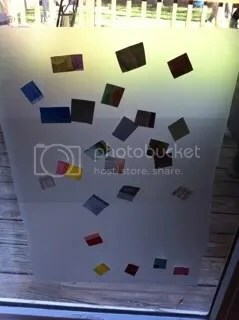 A few months ago I bought PlumGirl a peg board and made her some cards to go with it so that she would practice her color matching. 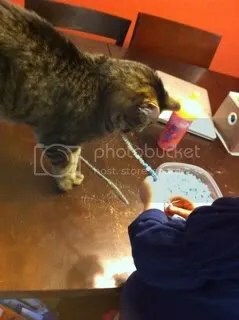 She played with it a few times, but really was not too interested in it. Fast forward to the last month or so, and she has been using it quite a bit. She likes to do all the pegs of one color and then move on to the next. 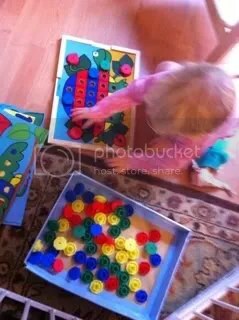 When I am doing this with her I help her count how many she need of each color, how many she has done, how many she has left, and so on. The sheets that came with the board are actually quite fun now that she is older and the ones that I made got recycled. PlumGirls does not like the white side of the sheets at all. Her interest in this toy is definitely for the color matching and not yet for any creative use. 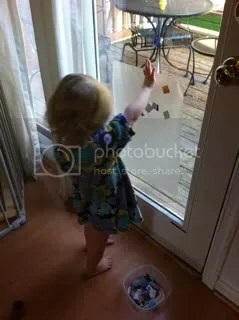 A few months ago I taped a piece of contact paper to a window, gave PlumGirl a tub of squares of paper, and let her have some fun. She enjoyed herself, but the activity did not last long. Inspired by this wonderful toothpick collage over at Let Kids Create, I decided to try the activity again. This time PlumGirl was much more excited about it. PlumGirl even helped hand the contact paper as she loves to help whenever I am using tape. She also enjoyed naming the colors as she stuck them on. 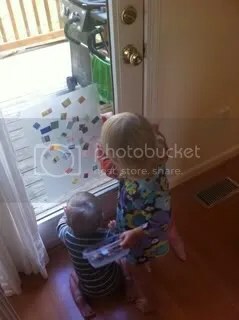 It was a good thing we started during the PlumTwins’ nap time, because as soon as they noticed the new attraction hanging on the window they were obsessed. Luckily, PlumGirl was very excited about showing her brother exactly what the activity was all about. 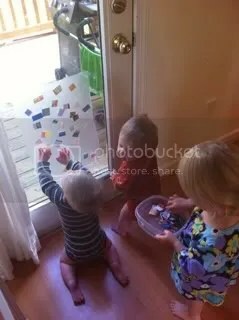 She showed them the tub of paper, how she picked out a piece, told them the color of the paper, and then demonstrated how to stick it on. They loved it! Plum1 was especially entranced by the stickiness of the contact paper. 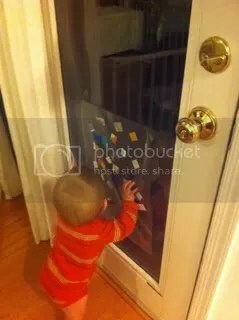 He kept crawling back and pressing his hand against it over and over again up until bedtime. 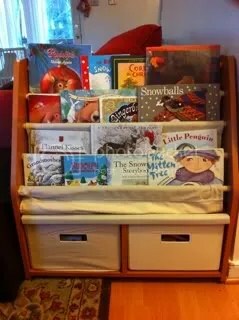 I absolutely love the idea of a book advent calendar. Twenty-four books wrapped in paper under the tree with one picked each day of December. Laura of Art for Little Hands has a wonderful post with links to other resources for this wonderful project. I, however, just do not have the ability to do it this year. So, I have compromised. I filled our living room book shelf with a bunch of winter and Christmas themed books and we have really been enjoying them so far. PulmGirl definitely has a few favorites already. 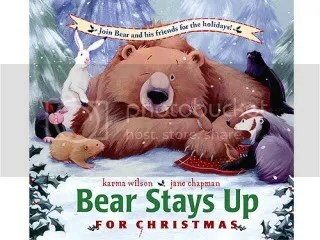 Bear Snores On is an old friend, and we have now added Bear Stays up for Christmas, the two of which MUST be read together. 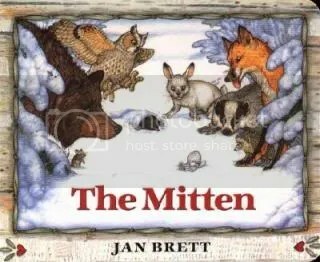 Two Jan Brett books that PlumGirl is enjoying are The Mitten and Gingerbread Baby. 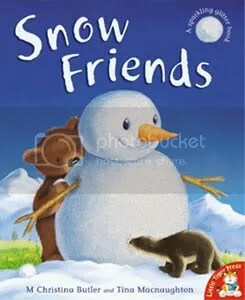 Snow Friends is currently living on the kitchen table where it is read at every meal. 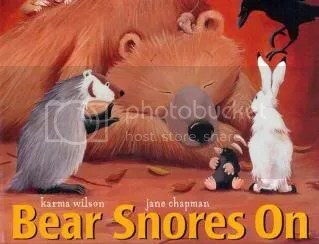 I am sure that we will have new favorites next week, especially since I have a few more books on the way. I love Alibris for buying used books relatively cheaply, but the shipping can sometimes be slow. Since I am pretty much addicted to buying books (see evidence here), I have to get them as cheaply as possible so I put up with the slow shipping for books that I cannot find cheaply Amazon. Update: Having just seen this post over at Chasing Cheerios I am even more excited to do an book Advent “Calendar” next year. I love her reusable bags and that she includes an activity in each bag with each book! Once again PlumGirl and I rebelled at her Gym & Art class. 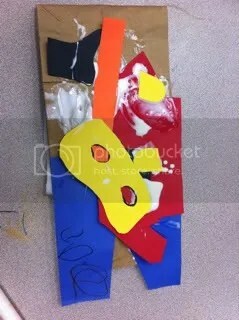 We were supposed to make a cookie-cutter super hero out of precut pieces and paper bags, and I watched many other moms, I mean kids, do just that. I let PlumGirl paint the glue wherever her little heart desired, and then I put the paper pieces on her piles of glue. She still is not very interested in putting the pieces on herself, but likes for me to put them on where she decides the glue goes. This was her end result. I think he is the toughest super hero ever.